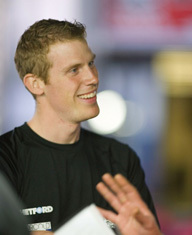 Chris Dyson has his own Motorsport History and a very strong future in the sport. Chris shared with the Road Racers Podcast – some of “his” history – in his own words and let us see what makes him tick. This was our first opportunity to talk one on one with Chris – as he keeps himself very busy – not only as one of the RaceCar Drivers on the Dyson Racing Team – but he also has Dyson Racing Management responsibilities.